I often hear fiction authors struggling with ways to market their novels. Non-fiction authors seem to have an easier time with marketing, due to their expertise on their subject. But fiction authors actually have quite a bit of nonfiction in their novels. Remember all that research you’ve done? As Christian writers, our characters and story lines have a built-in message of faith. Writing articles on your own faith struggles and how they relate to your character’s journey is one way to use non-fiction. Think about your character’s occupation. Is your heroine a landscaper? Write some posts on the best plants in your region. Or tie it in with the setting of your novel. A post on the best plants in the region of your book is even better. You could also spin it and list which plants are best transplanted in any region. My heroine is a cook on a cattle drive. The pioneers only used cast iron, so I wrote a post on how to care and use cast iron. Did you find cool facts when you were researching that didn’t make it in to your novel? Then consider writing some articles on these. These make great blog posts, but try taking it a step further. I pitched the idea to my local newspaper about a monthly column, Pioneering Today, which highlights the best of the pioneer lifestyle and how it relates to us today. The editor gave me permission to re-publish the articles on my blog after the current issue has run. I can offer links or pictures, so readers of the newspaper have a reason to visit my website for more information. Consider magazines or ezines to submit these articles to as well. What are some of your favorite non-writing blogs and magazines? How could you tie in an aspect of your writing or book to these? What ways have you used non-fiction to market your fiction? This entry was posted in Fiction, Marketing and Promotion, Non-fiction, Writing and tagged how to market fiction, magazine articles, market fiction, Melissa K. Norris, using nonfiction to market fiction by Melissa K. Norris. Bookmark the permalink. You’re welcome, Sherri. I hope this helps. Some great ideas here, Melissa. I do use some of my research and reenacting for posts. What a fantastic idea! I write historical fiction and have learned more about life during the Revolutionary War than I thought possible. It never occured to me to share that. Thank you. I’m so glad it helped, Ann. The Revolutionary War is the one I know the least about it, though all of America’s history fascinates me. I bet you’ve got some great material to work with. Just LOVE this idea. Thank you SO much. I’m glad it helped, Joanne. 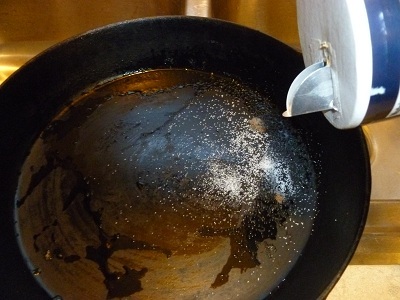 Very useful ideas – And thanks for the tips on cast iron! I adore my cast iron skillet and use it to cook everything. Susan, you’re welcome. A fellow cast iron user, yea! I don’t use anything else, I even have a cast iron grill for the barbecue. Though I use my spider leg Dutch oven when we’re camping or on the open fire. Don’t you think the food just tastes better? I never really thought about how the food tastes. I’ll have to pay better attention! I do like how it cooks everything evenly and I don’t have to worry about a thin pan scorching. Teflon is for amateurs! Nice tickler Melissa. I would only add that as a non-fiction author, I equally end up with cuts that make great article or blog pieces. No matter what book we’re working on, most of us end up with more research than we can use. Great platform-building idea. Thanks! Anita, I bet you do end up with a lot of material. I wonder if we could flip this for non-fiction. A short fictional story dealing with your non-fiction message…..
Actually, that’s exactly how I write non-fiction. Exposition tells, and my fictional tale shows. I like the flip and the mix works for my messages. But you are so right about taking the excess and writing articles and blogs from it. Great ideas! Like Anita mentioned, I’ve heard the tip of writing articles to promote a non-fiction book. I hadn’t thought of using it with non-fiction. Great idea. Ironically, a friend of mine had the opposite experience as what you mention in your opening two sentences. Her non-fiction book was rejected and she was told it would be easier to do non-fiction if she had a fan base following fiction books. She wrote six or seven fiction books before her first non-fiction. Congrats to your friend for not giving up Janey. She ended up getting seven books total from that rejection. That’s awesome. I hope you can find away to use fiction for your non-fiction. Thanks for sharing. Loved those ideas…I’m already storing some up for the release of my first novel! Congrats on your book, Cindy! I hope they help you. I find it best to brainstorm a huge list and then pick one or two to focus on for the moment. These are good ideas! Rob Eagar of Wildfire Marketing has some similar ideas that springboard off his marketing approach. The people who are particularly interested in your genre/time period/specific research would enjoy this type of article. They are what he calls “kindling.”. They read your articles or listen to your speeches at their clubs, get interested in your book, and tell others. They are the “kindling,” sparking a bigger fire of interest in your work. Melinda, I subscribe to Rob’s newsletter and he does have some great ideas. I’m glad my article reminded you of his, I know I’m on the right track. If we can get people talking about or work and telling others, then we’ve done our job well. Thanks! This is exactly the advice my publicist gave me, Melissa. Good post. That’s awesome and I’m glad I’m on the right track then. 🙂 Thanks, Janalyn! These are great ideas, Melissa, and I’m writing them into my marketing plans for the next year. Finally, a way to use up all that research! Thanks so much for this post! I’m glad they helped you, Jan! There seemed to be so much research that didn’t make it into a scene, but I had to know, so I love being able to use it in another way. Do you have a post on how you write out your marketing plan?